Our stunning double room in New Delhi’s best bed and breakfast accommodation comes with a King size bed. The double rooms are spacious enough to fit two beds and allow you adequate space for normal movement. If you so require the beds can be moved to form twin beds for travelers who prefer space or sharing with a business colleague. Should you like family member to share, a third bed can also be easily accommodated. To accord you the best Homestays Delhi experience, our rooms are equipped with Sony cable TV and fitted with modern air conditioning and temperate controls. 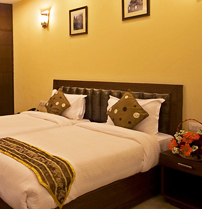 For business travelers seeking a bed and breakfast Delhi accommodation, our double rooms are meant to fit your profile. With work desk and office chair provided, you can comfortably work from your room. To further complement this, all double rooms come with wireless and Ethernet internet connections. Your valuables are safe in a modern electronic safe. 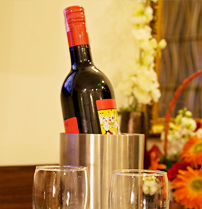 You could also order room service or enjoy mini bar in room to chill your own beverages. Our rooms also are fitted with a closet and bedside table to accord you enough placement space and offer much more amenities as available in star category hotels. All rooms offer state of the art washroom facilities complete with modern, sinks, toilets, pressure showers and much more. There is cold and hot running water at all times. The bathroom is safely located at the corner of the room, near the entrance and cleverly crafted to hide it from plain view when the door is closed. Thus ensuring privacy, especially if you are sharing the room with a work colleague while on business travel. We are delighted to mention that our rooms are dotted with a variant of lamp-works and lamp stands, and complemented with flower vases during special occasions. We look forward to accord you a true Indian B&B experience.